If you’ve read any works by Henry James, American-born British author (1843-1916), great suspense probably isn’t the first thought that leaps to your mind. Consider the all-important first sentence of his famous novella The Turn of the Screw. That’s sixty-two words in the first sentence alone. By today’s standards, such writing is “wordy” at best and “frankly hard to read” at worst. But writing styles come and go just like the bell-bottoms of the seventies, and during James’s day, this was cutting-edge stuff. Perhaps the economical writing so popular today has lost its sparkle and dumbed down what otherwise might be great literature. A discussion for another time. 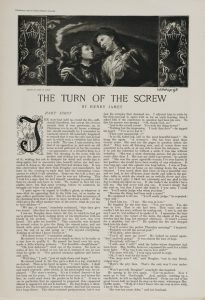 I don’t intend to bash Henry James’s writing style but to point out a writing technique he reinforced in my recent exploration of his famous (and heavily debated) story The Turn of the Screw. Actually, I listened to it and read it at the same time, and the vocal skills of Richard Armitage and Emma Thompson via audiobook made the journey even more enjoyable. The wind had risen and whistled through the trees. Again came the thump, thump. Sherlock began to whimper, and Biff tried to quiet him. Suddenly Chet let out a cry of terror! The next chapter, of course, begins where the last chapter ended. Now that’s not great literature, but you see my point. 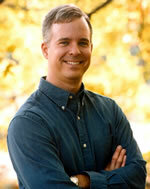 What does this Hardy Boys novel have to do with The Turn of the Screw? Not much except chapter-ending hooks, traditional cliffhangers, appear in this famous novella too. James knew how to write suspense. But before I give two examples, let me tell you a little more about the story. This novella is about a governess who agrees to look after two children, Flora and Miles, at an estate in Essex and sees a strange man lurking on the grounds. One day the man stares at her through the dining room window, startling her. Through a conversation with the housekeeper, Mrs. Grose, she learns the stranger is Peter Quint, a former valet and an unsavory character. But there’s more. Don’t miss the dramatic hook, actually the epiphany, at the end of chapter 5. [Mrs. Grose] hung fire so long that I was still more mystified. “He went, too,” she brought out at last. This revelation, of course, is what immediately turns the novella into the famous ghost story. The governess sees dead people. James used the technique again at the end of chapter 10. The governess believes Peter Quint’s ghost is trying to corrupt little Miles, and she begins watching the boy’s movements. One night she sees a figure on the grounds through a window. The moon made the night extraordinarily penetrable and showed me on the lawn a person, diminished by distance, who stood there motionless and as if fascinated, looking up to where I had appeared—looking, that is, not so much straight at me as at something that was apparently above me. There was clearly another person above me—there was a person on the tower; but the presence on the lawn was not in the least what I had conceived and had confidently hurried to meet. The presence on the lawn—I felt sick as I made it out—was poor little Miles himself. Why was Miles out of his bed and wandering around the grounds at night? What was he looking at above the governess? Do you dare stop reading? Oh, the stuff of great suspense. Of course, the best chapter ending of all is the novella’s famous conclusion, but I’ll leave that for you to explore. In 1898, authors knew how to weave suspense into their stories and leave hooks at chapter endings. I’d seen this technique as a boy while reading Hardy Boys books, but I was pleasantly surprised to see the same technique used in this example of classic literature. Perhaps there are more examples out there than I realize, just waiting to surprise me. Time to do more exploring. Stay tuned. What about you? Have you seen other examples of powerful suspense technique in great literature? If so, where? Feel free to sound off. Thank you, Barbara. I’ve tried some other Henry James, and let me just say that Turn of the Screw is probably shorter and lighter compared to many of his other stories and novels. Some of it (Portrait of a Lady, for example) takes some real work to get through. Unless there’s some sort of suspenseful element to the plot, I probably wouldn’t venture into it. Yes, I saw your review of Lavender and Old Lace. Some very good thoughts there. Thanks.